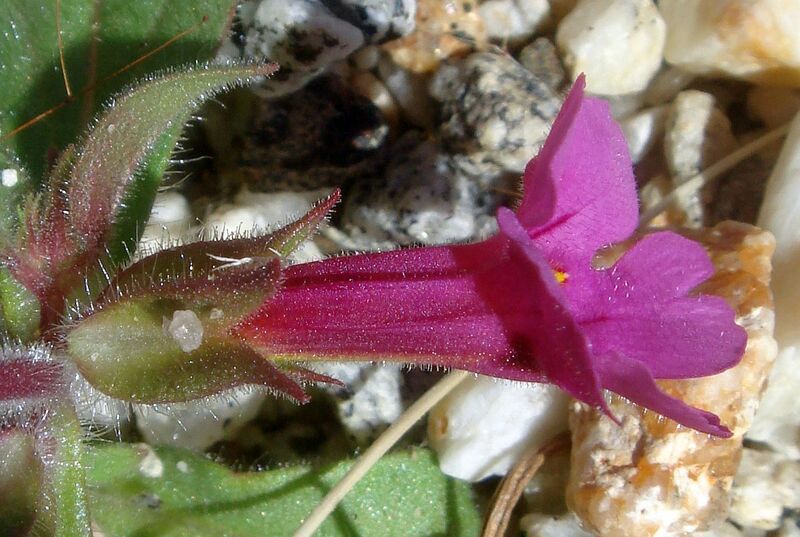 Where are the stigmas of M. bigelovii and M. fremontii? Fig. 1. 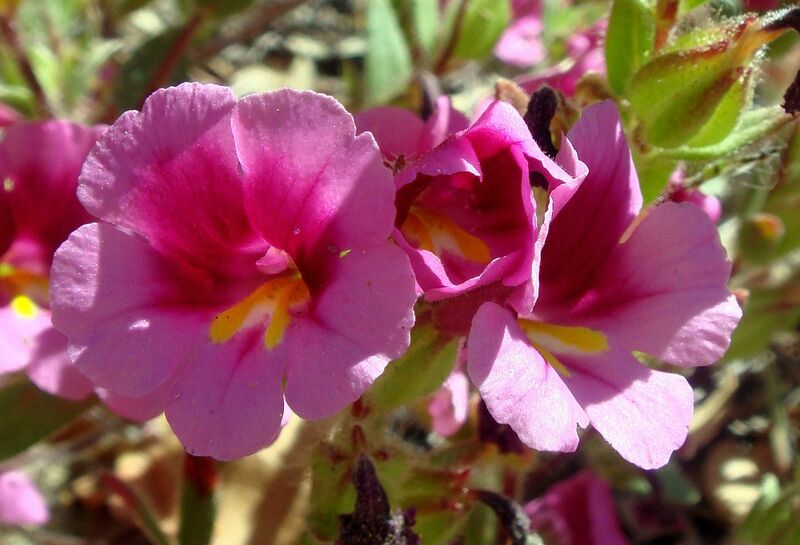 Left: Mimulus bigelovii; Right: Mimulus fremontii. Click on the pictures for larger versions. M. bigelovii tends to have wider yellow folds in its corolla mouth. It also tends to have more hairs on the face and inside portion of the corolla, but both species vary in how hairy they are inside the corolla. 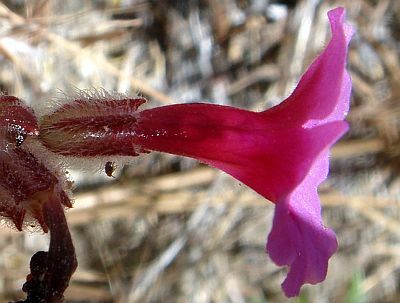 The calyx of M. bigelovii often has longer lobes that are often spreading away from the corolla, whereas the lobes of M. fremontii are short and erect. The hairs on the calyx of M. bigelovii tend to be sparser and more translucent; the hairs on the calyx of M. fremontii tend to be denser and white. Note the large difference in hairiness of the calyx in the two pictures of M. fremontii, and that both species have a calyx color that ranges from green to red. Top and middle left pictures taken by Tom Chester on 23 February 2010 on the Alcoholic Pass Trail at Anza-Borrego State Park (ABDSP). Top right picture taken by Tom Chester on 14 May 2013 at the James Reserve, San Jacinto Mountain. Middle right picture taken by Wendy Walker on 15 May 2011 in Pinon Hills, in the transition zone between the Mojave Desert and the San Gabriel Mountains. Lower left picture taken by Keir Morse in ABDSP on 5 March 2011. Lower right picture taken by Tom Chester in Idyllwild County Park, San Jacinto Mountain, on 6 July 2010. 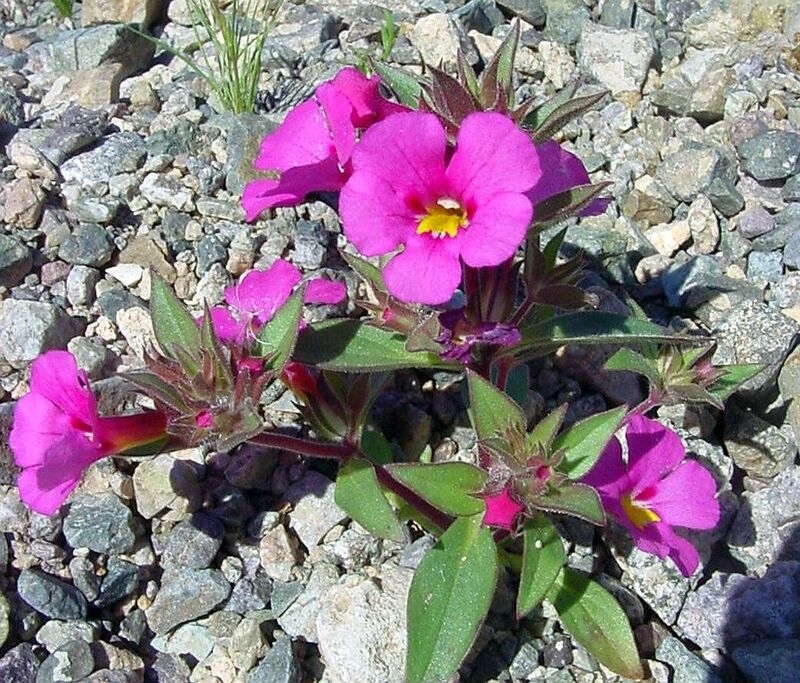 When Jane Strong and I were budding botanists and working on the Mimulus bigelovii, M. fremontii and M. johnstonii separation, we had a lot of trouble. One thing that particularly bothered us was the number of flowers per node; which didn't work for the usual depauperate plants seen in most years, and we weren't sure exactly what that meant (see below). I was much happier when I was working in areas where only one of those species existed since I didn't have to try to figure out which one it was! 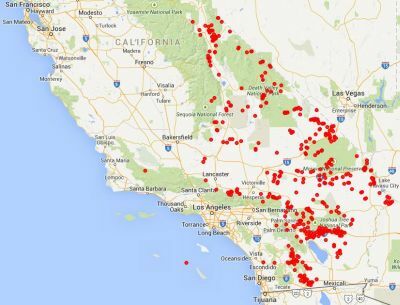 How to separate these species came up again when I botanized the San Gabriel Mountain / Mojave Desert transition area near Pinon Hills in 2014 and 2015, where both species were vouchered. This page is the result of work done to try to figure out how best to separate Mimulus bigelovii and M. fremontii. In particular, I finally figured out what the number of flowers per node actually meant, and that it was useful in separating the two species! M. johnstonii is not discussed here, since is actually fairly easy to distinguish from the other two species. 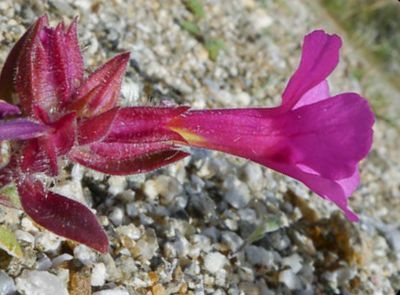 M. johnstonii has very asymmetric calyx lobes, with the upper lobes over twice as long as the lower lobes, and it grows in a distinctive habitat on scree slopes. Neither of those is the case for the other two species. 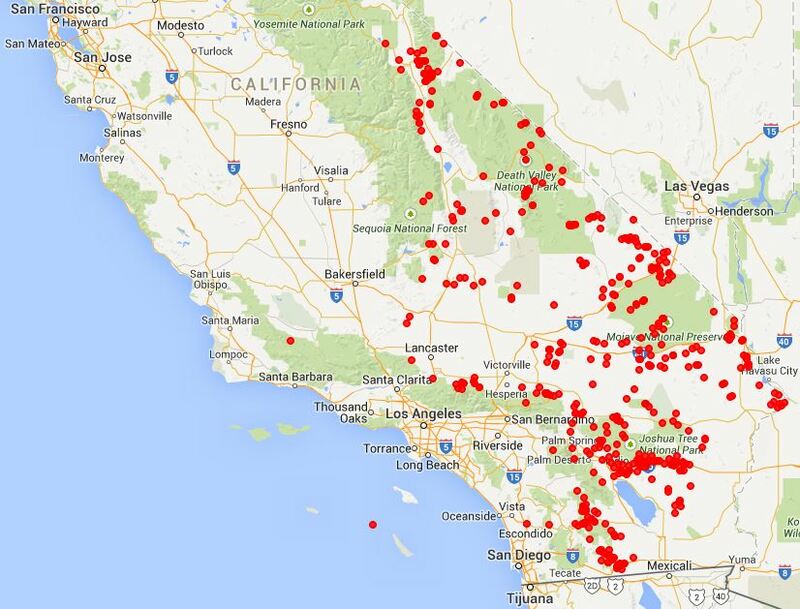 Mimulus bigelovii and M. fremontii are clearly distinct species, separated by a number of characteristics, and mostly exist in different geographic areas; see the voucher distribution maps below in the Geographic Distribution of These Species. 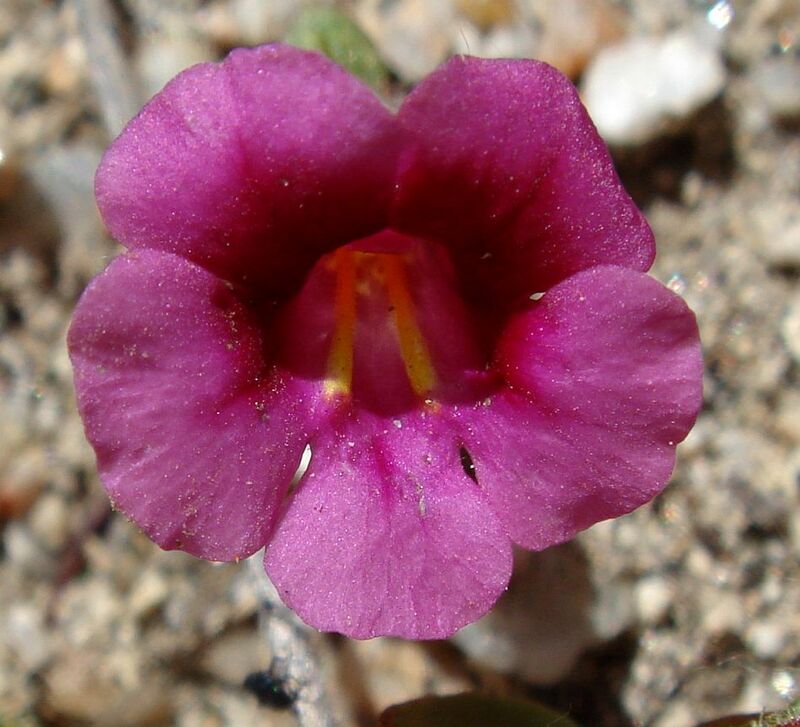 M. bigelovii is a desert species, dropping out in the desert transition zone to the mountains. 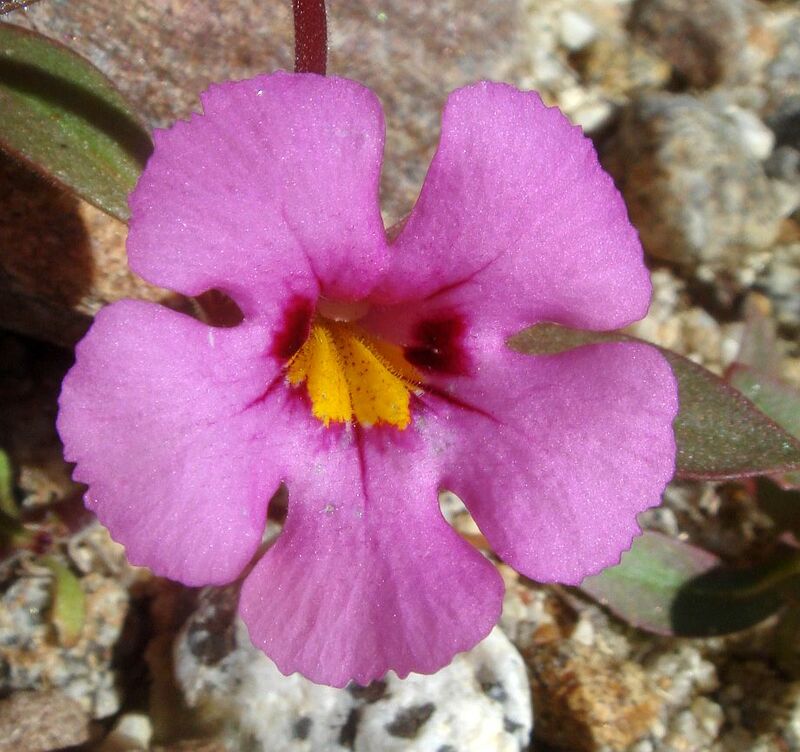 M. fremontii is a montane and coastal species, dropping out in the desert transition zone to the desert. 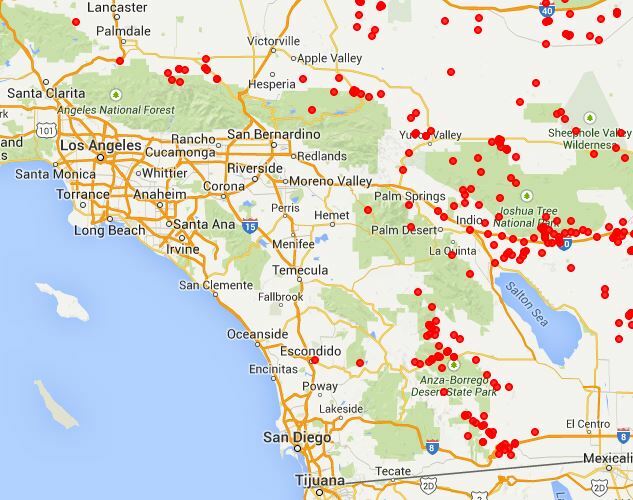 The only place these species overlap is in that desert transition zone. Table 1 gives the characteristics that seem most reliable in separating these two species, listed in declining order of reliability / easy of use. Many of these characteristics is linked to a more complete discussion with accompanying photographs. Unfortunately, many of the best distinguishing characteristics are not easily seen in most photographs. Fig. 1 shows photographs of the flowers from the front, and of the calyx from the side, and discusses the differences that can sometimes be seen in those views. Caveat: I have not done extensive work on this separation, and I have not yet able to consult the recent monograph of these species (Thompson Systematic Botany Monographs 2005), so this is more or less my first take on this topic. As always, comments are welcome! Maximum # of Flowers per stem node Two, one in the axil of each of the opposite leaves, with the pedicel of each originating in each axil. Some nodes may have only a single flower. Always one, in the axil of one of the opposite leaves, plus sometimes a short infl branch bearing additional flowers that may make it appear there are two flowers per stem node in photographs. 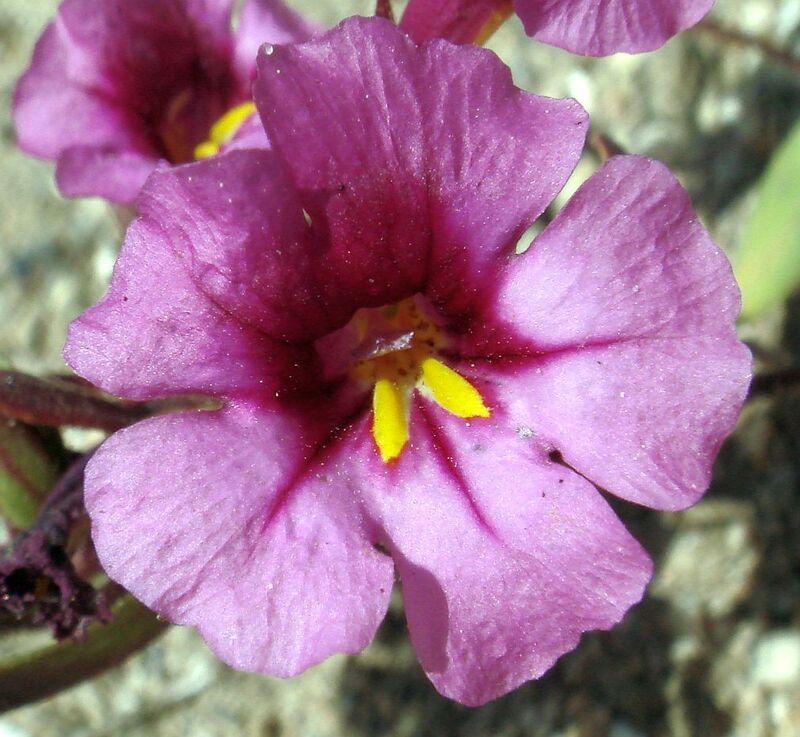 However, in that case, only one of the flowers will be seen to have a pedicel originating in an axil. Calyx lobes (see Fig. 1) lobes often spreading away from the corolla, ± acuminate, 1.5-6 mm lobes erect, acute to short-pointed, 0.5-3.5 mm. Hairs on inner face of corolla lobes Hairs often present. Hairs rarely present. 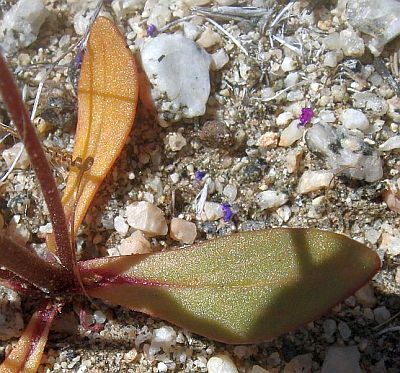 The Jepson Manual Second Edition treatment says that the entire plant of M. bigelovii is densely hairy, whereas the leaves of M. fremontii are lowest glabrous, upper hairy. Fig. 2 shows the difference in the hairiness of the leaves for two young plants, most of which would be the lowermost leaves of a plant in bloom, as well as the difference in the hairiness for basal leaves of mature plants. This characteristic is perhaps the easiest to use in the field. Fig. 2. 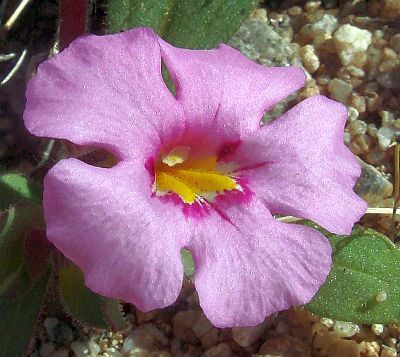 Left: Mimulus bigelovii. 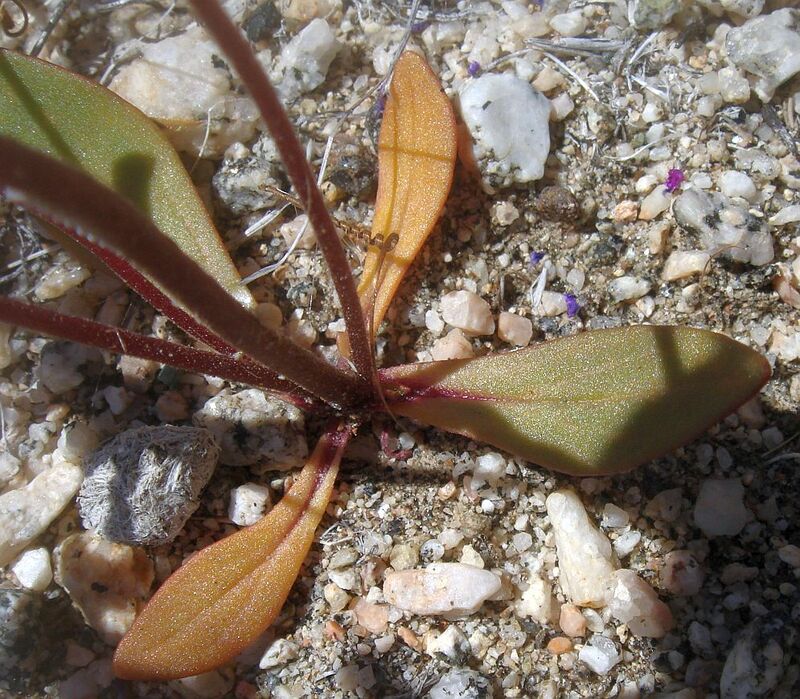 Top: showing hairs on all the leaves of this young plant, including obvious longer hairs on the upper leaf surface for all but the most basal leaves, which have very short hairs on their edges visible in the linked full-resolution picture. 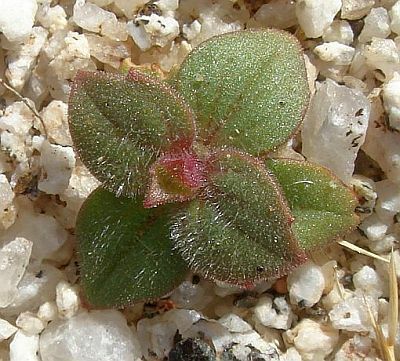 Bottom: short hairs are still visible on the basal leaves of this mature plant. 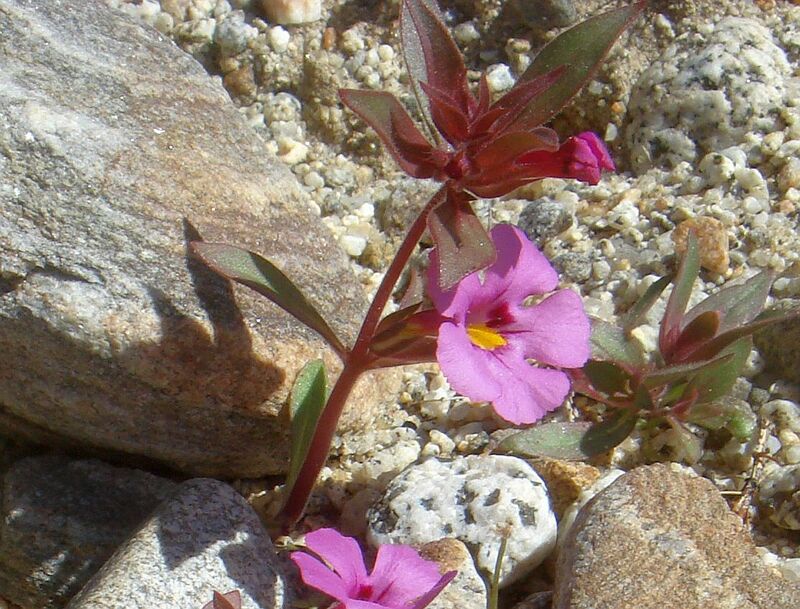 Right: Mimulus fremontii. Top: showing glabrous lowermost leaves. Bottom: basal glabrous leaves of a mature plant. This was first noted as a distinguishing characteristic between the two species in the First Edition Jepson Manual treatment by David Thompson. Prior to that, no one had ever noticed such a difference in the inflorescence! This characteristic was a major advance in helping to distinguish these two species, as long as one had a sample one could carefully examine, and one properly understood exactly what this meant. When Jane Strong and I were beginning botanists, we knew that leaves were at nodes of the stem. What confused us was whether a node with opposite leaves counted as one node or two nodes. Harris and Harris 2000, p. 73, define node as the position on the stem where leaves or branches originate, making it clear that a single stem node can have any number of leaves or branches originating from it. 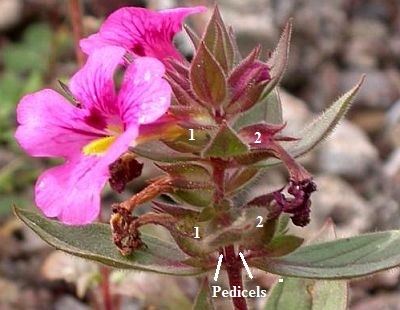 Since these two Mimulus species have opposite leaves, two flowers per node means one flower in the axil of each leaf, with the pedicel of each flower originating in each axil. One flower per node means that a single flower is in the axil of one of the opposite leaves, and the axil of the other opposite leaf either has no flower at all, or it has a branch originating there. 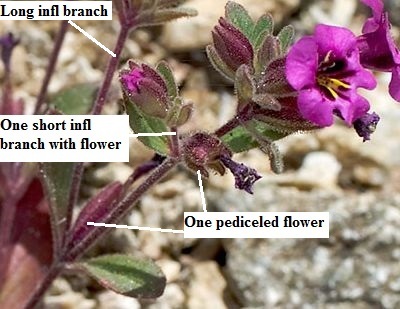 Note that it might be clearer to state the maximum number of pediceled flowers per node, with the base of the pedicel at the node, since at a glance the flowers of M. fremontii can appear to have two flowers per node, even though only one has a pedicel that actually arises from that node, with the other flower being on a short branch. Fig. 3 illustrates the difference between the two flowers per node at most nodes for M. bigelovii, and the single flower per node, plus sometimes a short inflorescence branch with more flowers, that is typical of M. fremontii. Fig. 3. Illustration showing the difference between two flowers arising directly from a stem node (left); and having a single flower arising directly from a stem node, accompanied by a short inflorescence branch with its first flower blooming at the same time as the other flower (right). A pair of opposite leaves is shown at single node shown on the left, and at the two nodes shown on the right (the second is the node on the inflorescence branch). The case on the right can easily appear as two flowers per node in the field, and in photographs, especially if the inflorescence branch is short, or hidden by the flower. There are few photographs that I have taken, or at Calphotos, that show the difference between two flowers per node, or not, very clearly! The major difficulty is that most of the time, the open flowers are at the top of the stem, where the nodes are compressed together so much it is nearly impossible to distinguish them in a photograph. Even in the field, such compressed nodes make it difficult to reliably determine the number of flowers per node. The best photographs I could find are in Fig. 4, both from Calphotos and not from the fairly large number of photographs I have taken. 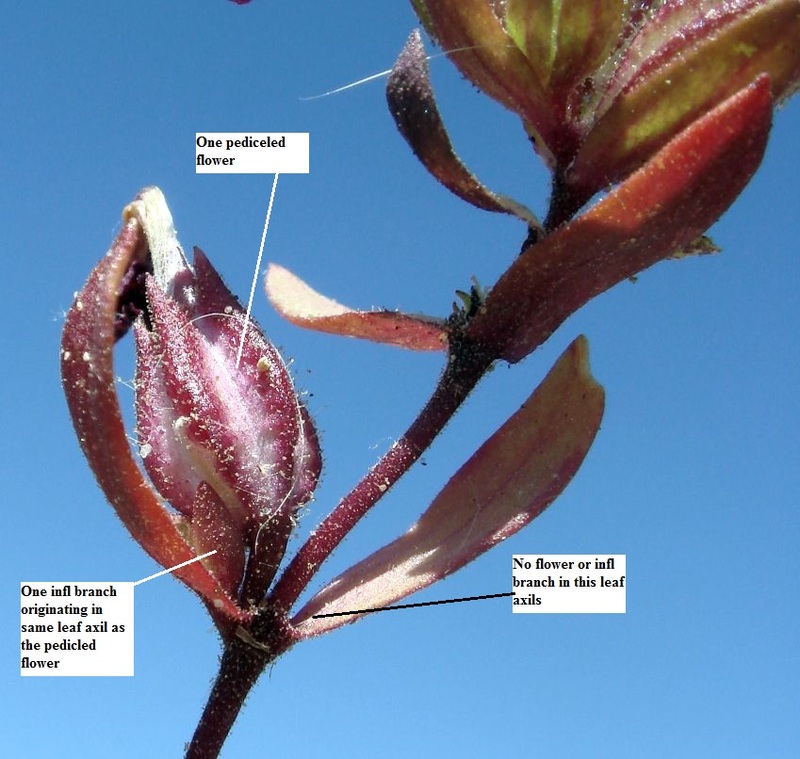 These photographs show the number of flowers per node most clearly for the areas of the stem where the flowers are finished blooming. This would be a target for few photographers, and I didn't realize until I made this page that photographing finished flowers was important to show this characteristic. 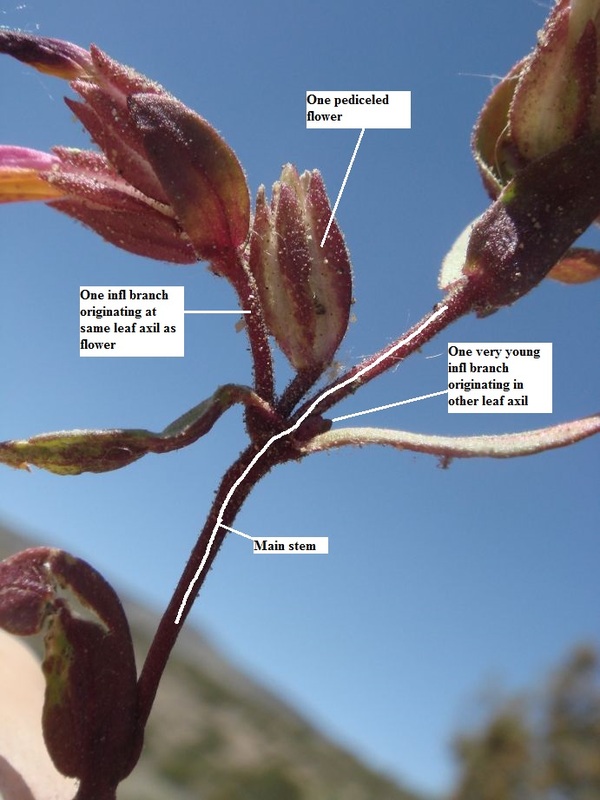 After I wrote an earlier draft of this page, Michael Charters went out in the field specifically to photograph the nodes of M. fremontii at the Puma Reserve near Pinon Hills at the San Gabriel Mountain / Mojave Desert transition. These were the plants that directly stimulated this page, since both Michael and I independently thought there were two flowers per node on them! 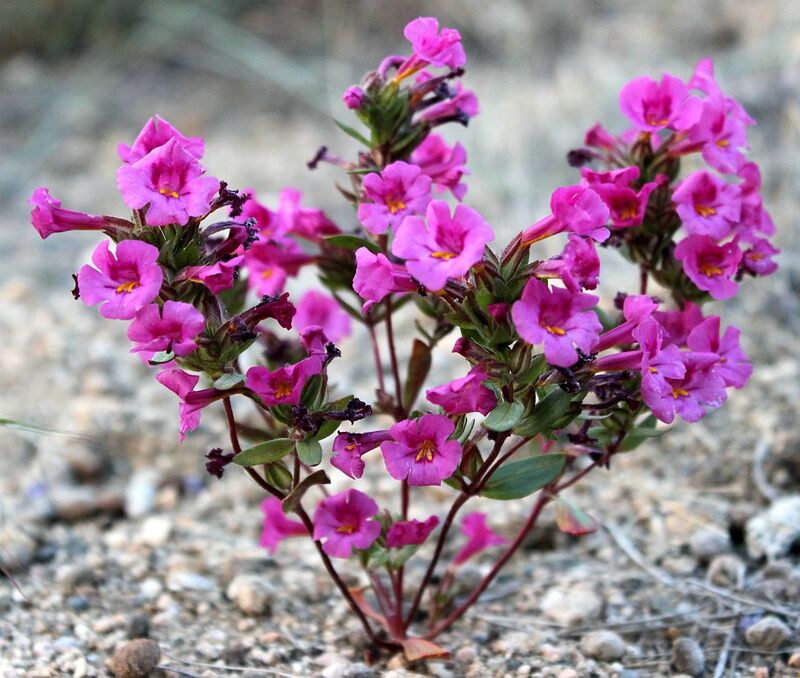 In fact, not a single plant we checked actually has more than a single flower per node. Michael also found that the nodes can have inflorescence branches that accompany the pediceled flower, with some nodes thus having a pediceled flower plus two inflorescence branches; see a node with a pediceled flower and an inflorescence branch originating at the same leaf axils; and a node with a pediceled flower and two inflorescence branches. Fig. 4. 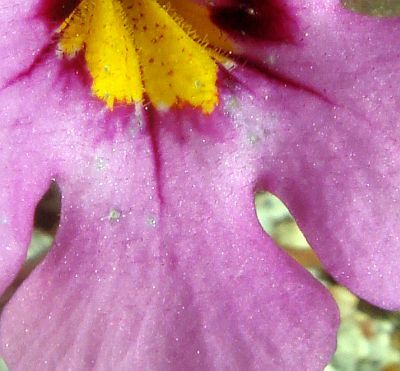 Left: Mimulus bigelovii; top: showing two flowers per node at a large number of nodes, some flowers are labeled 1 and 2; bottom, showing only one flower per node at the lowest node. 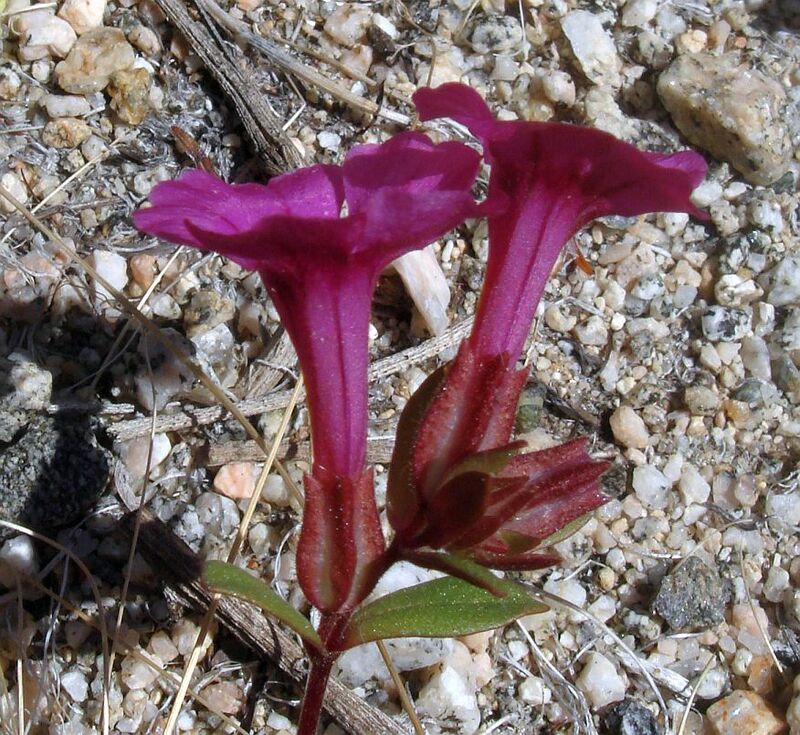 Right: Mimulus fremontii; top: showing a single pediceled flower at two different nodes plus a single inflorescence branch at each of those nodes, one long branch at one node and one short branch at the other node; bottom: showing a single flower per node without any inflorescence branch. Click on the pictures for larger versions. Photo credits: Top row: left: Jim Andre, Calphotos; right: Aaron Schusteff, Calphotos. 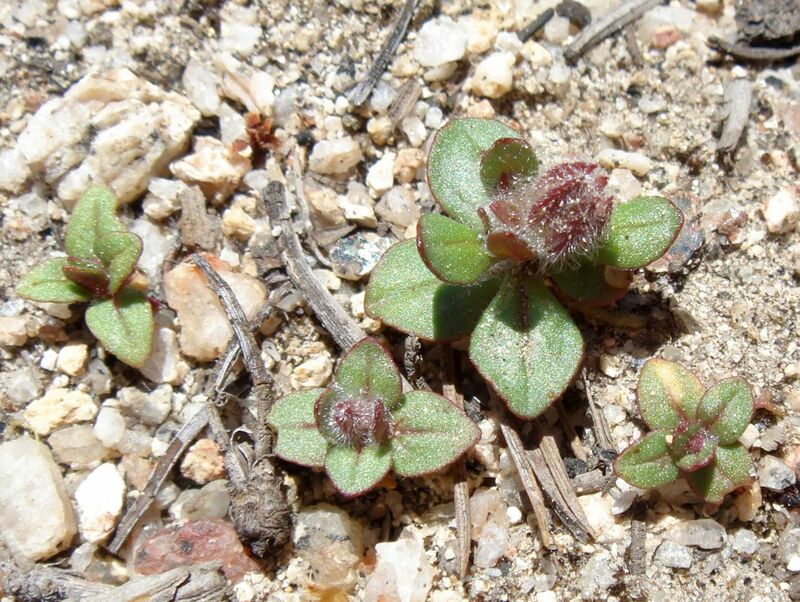 Bottom row: Tom Chester; left taken on 23 February 2010 from Alcoholic Pass, ABDSP; right taken in the Pinon Hills area of the Mojave Desert on 3 April 2014. The word pilose, meaning bearing long, soft, straight hairs (Harris and Harris 2000 p. 86), is extremely misleading here, since one usually thinks of pilose hairs as being dense, as in the illustration in Harris and Harris. The key should say Inner face of corolla-lobes with extremely-sparse long hairs, since I've never seen a photograph showing more dense hairs. This characteristic seems fraught with peril to use. 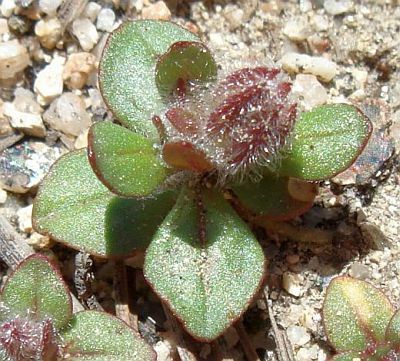 The hairs appear to be variably present on the corolla lobes for M. bigelovii; Fig. 5 show photographs from flowers from the same location, one flower with obvious hairs and one flower without. Fig. 5. 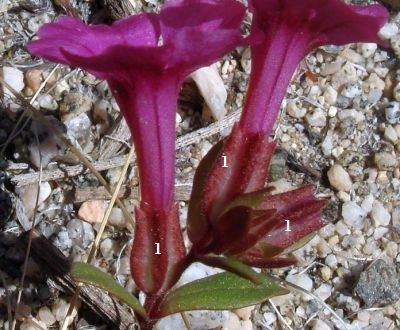 Photographs of plants of Mimulus bigelovii from the same location, one flower showing obvious hairs on the corolla lobes (left); the other not showing any obvious hairs (right). 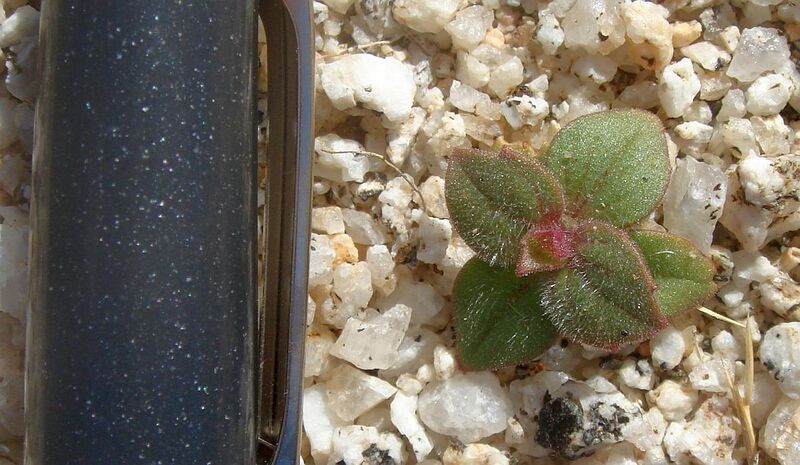 Furthermore, although most plants of M. fremontii lack those hairs, some populations appear to have similar hairs. 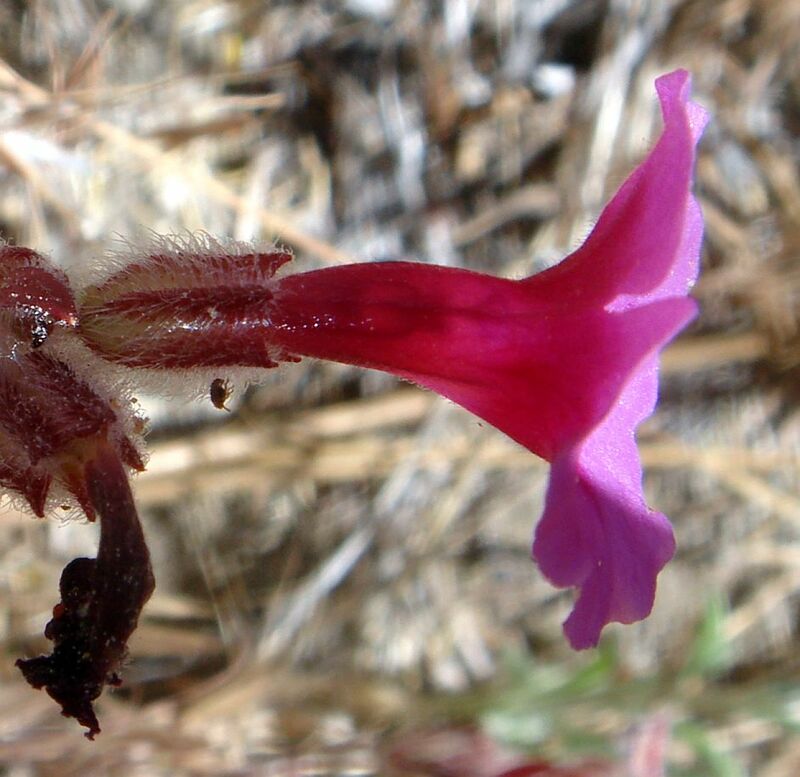 Although every picture I've taken of M. fremontii in southern California shows no hairs on the inner face of the corolla lobes, RT Hawke took a picture of a plant that shows similar long hairs on the inner face of its corolla lobes determined as M. fremontii by the Mimulus expert Naomi Fraga. 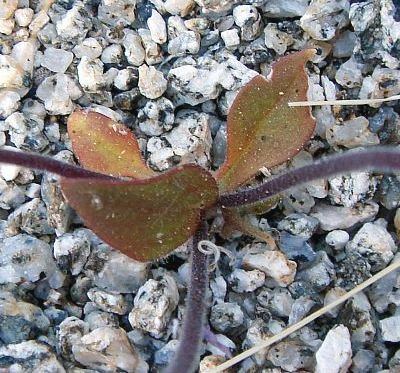 RT's plant was from the southern end of the Sierra Nevada; it may just be that plants of M. fremontii are a bit different there. Other Calphotos pictures that may show similar hairs are one from "California" by Steve Schoenig and one from Kelso Creek Valley, Kern County, by Lara Hartley, also from the southern end of the Sierra Nevada. Perhaps the biggest problem with this characteristic is that most photographs do not have the resolution to show such hairs. Although the leaf shape was used to discriminate these two species in Munz 1974 (leaves ± elliptic for M. bigelovii, and ± lanceolate for M. fremontii), and the leaves may have different shapes between the different species at times, this seems like a very unreliable way to distinguish the species since the leaves very markedly even on a single plant. 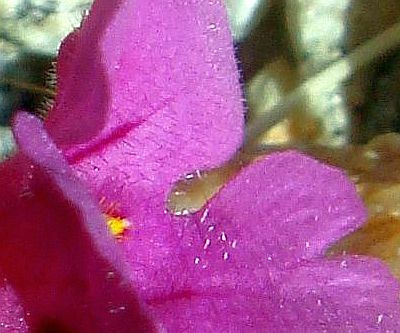 The color of the hairs on the calyx has also been said to separate the species, stalked-translucent glandular for M. bigelovii, and white-hairy for M. fremontii. However, photographs show a large variation in the hairs, especially for M. fremontii. A plant with a clearly white-hairy calyx might always be M. fremontii, but a plant with any other calyx could be either species. Although Jepson, in his 1925 Manual, separated the two species on the calyx increasing conspicuously in fruit for M. bigelovii, and increasing but little in fruit for M. fremontii, the Jepson Manual second edition reverses it, putting M. bigelovii under the branch with calyx occasionally inflated, and M. fremontii under the branch calyx generally inflated or swollen. I don't see any clear difference in photographs. 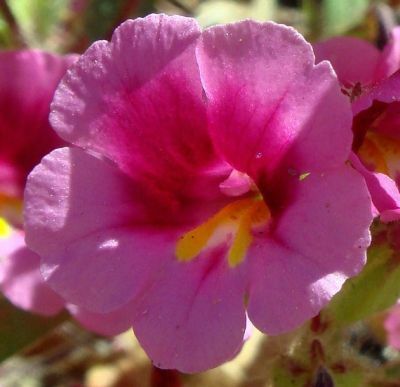 There may also be a difference in the gestalt of the flowers that can be picked up by experts like Naomi Fraga, and is often seen in looking at Calphotos pictures. Characteristics like the width of the yellow folds in the corolla mouth, the hairs in the corolla mouth, and the shape of the corolla lobes do seem to differ between the species, but it is very difficult to quantify those differences, or even to establish them as other than traits that sometimes distinguish them. Another difference that struck me in looking at my pictures is that M. bigelovii can sometimes produce very showy compact displays of flowers, whereasa when M. fremontii produces a showy display, the flowers are more spaced (photograph from Wendy Walker). In an earlier version of this page, I had a note on the upper right photograph in Fig. 4, since Aaron Schusteff's closeup photograph of the flower shows the stigma slightly exserted from the corolla mouth, which was not seen in any other M. fremontii photographs at Calphotos, nor in any M. bigelovii photographs at Calphotos. The Jepson Manual is silent on where exactly the stigma is for these two species relative to the corolla mouth, but Abrams keyed them both under Stigmas and anthers included in the corolla-throat, the former not or barely reaching the bases of the corolla-lobes. Although Aaron's plant did not seem inconsistent with that key, it was curious that no one else had any stigmas visible in their pictures. 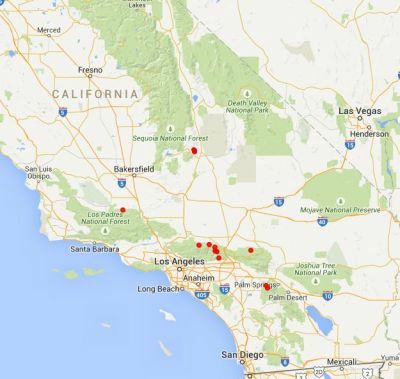 I speculated that maybe Aaron's plants were a bit different from the main population of M. fremontii, since his plant was from Monterey County, at the extreme northern end of the range of that species. 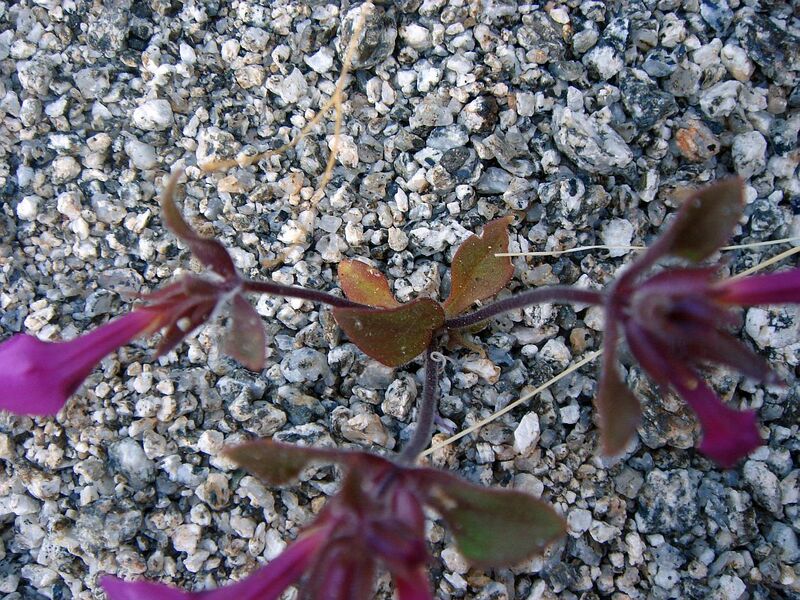 Michael Charters quickly resolved this issue by going to the Puma Reserve near Pinon Hills at the San Gabriel Mountain / Mojave Desert transition, in the heart of the range of M. fremontii, and finding a number of flowers that had visible stigmas that appeared similar to the ones in Aaron's picture. Furthermore, Michael went through his pictures of both species and found another plant of M. fremontii from Idyllwild that showed the stigmas, and three photographs of M. bigelovii from throughout its range showing stigmas. Fig. 6 shows Michael's photographs with visible stigmas. I subsequently noticed that the top two photographs on this page, in Fig. 1, also show stigmas. The stigma is nearly invisible in the top right photo since it is appressed to the roof of the corolla mouth, and has a similar color to the throat. 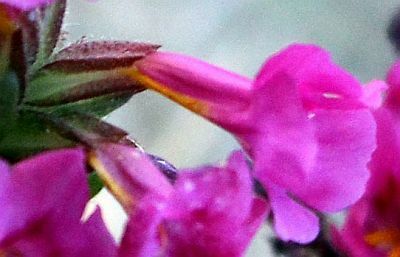 Perhaps the stigmas are just very hard to see in most photographs, blending in with the blotches and colors of the throat. Fig. 6. 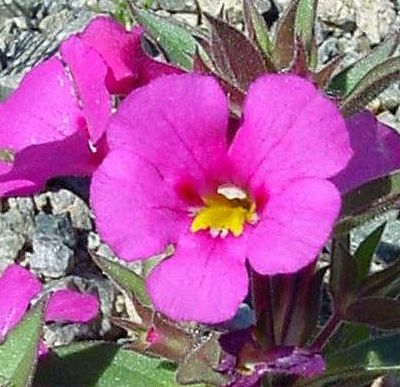 Left: Mimulus bigelovii. 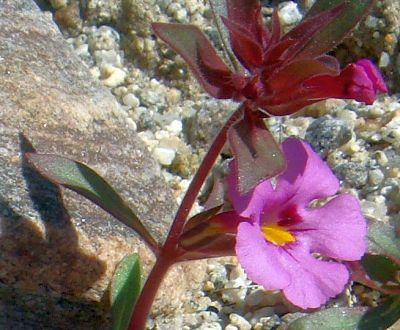 Right: Mimulus fremontii. Photographs by Michael Charters. Click on the pictures for larger versions. Photo locations: Top row: left: Corn Springs Road; right: Puma Reserve, Pinon Hills Area. 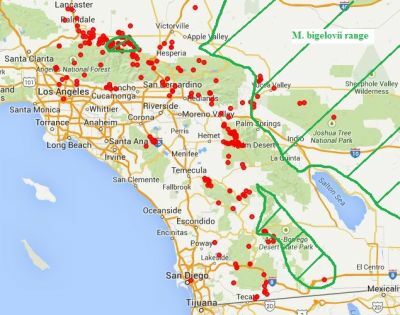 Bottom row: left: East Mojave; right: Idyllwild County Park. Fig. 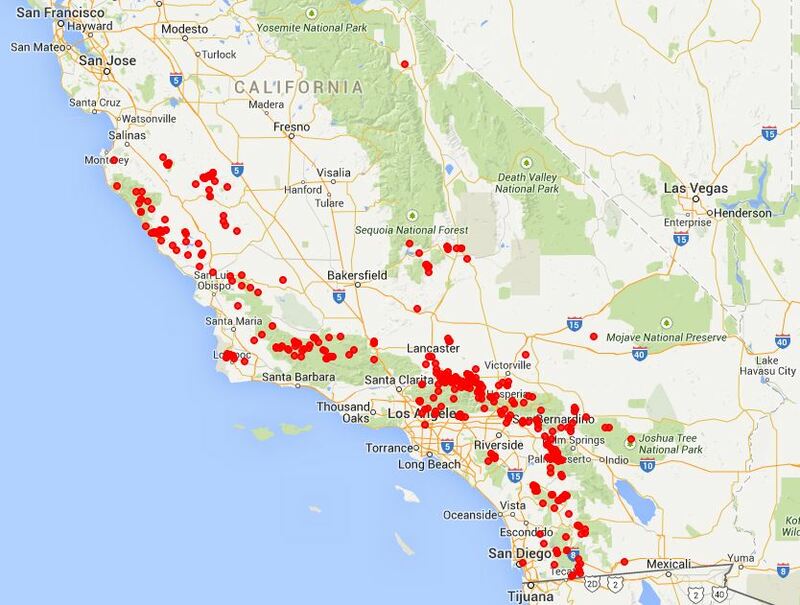 7 shows the geographic distribution of these species using all vouchers at the Consortium of California Herbaria, retrieved on 30 April 2015. Fig. 7. 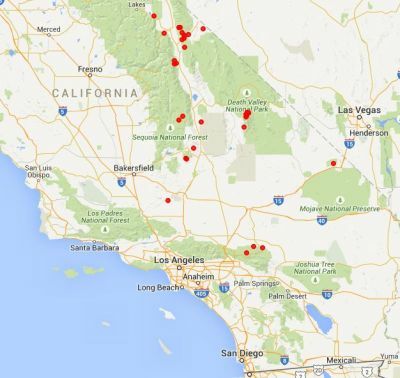 Geographic distribution of Mimulus bigelovii (left) and M. fremontii (right) from vouchers. Top: the full range for both species. Second row: the range in southern California. 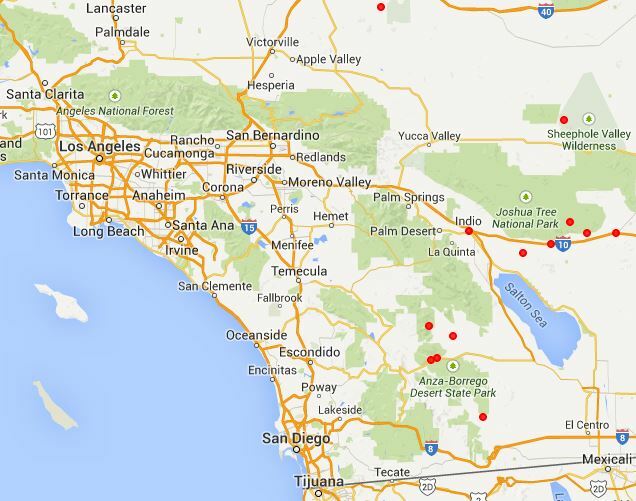 Third row: the range in southern California for each species, with the range for the other species drawn in. Bottom: the range in southern California using only vouchers from RSA/POM. See text for comments. Click on the maps to get larger versions. an area in the southernmost Sierra Nevada where both species are vouchered. The last set of voucher plots in Fig. 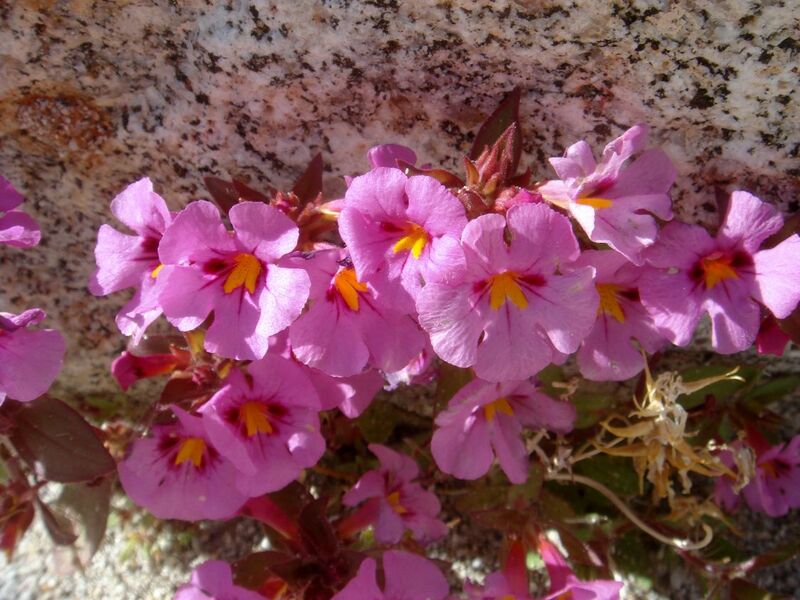 7 give just the distributions from RSA/POM, where the Mimulus expert Naomi Fraga works. Those RSA/POM vouchers would be expected to have the most reliable determinations. It is interesting that those plots completely eliminate the overlap between the two species in the Banning Pass / Yucca Valley finger (placing only M. bigelovii there), and on the north side of the San Gabriels (placing only M. fremontii there). The RSA/POM vouchers (no map shown) also only place M. fremontii for the area in the southernmost Sierra Nevada. 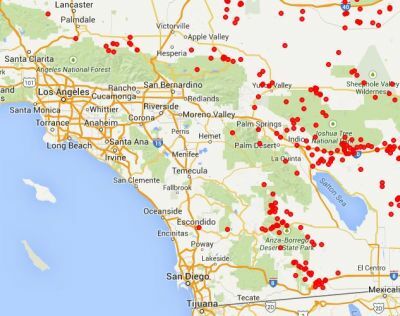 Clearly the vouchers from other institutions should be reexamined for those overlap areas to see if some of them are misdetermined. Fig. 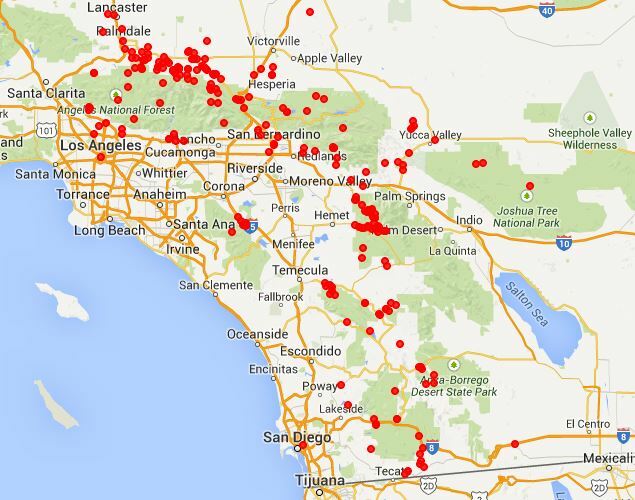 8 shows the voucher distribution maps for vouchers above 6000 feet elevation. Fig. 8. Geographic distribution of Mimulus bigelovii (left) and M. fremontii (right) from vouchers with stated elevations above 6000 feet. 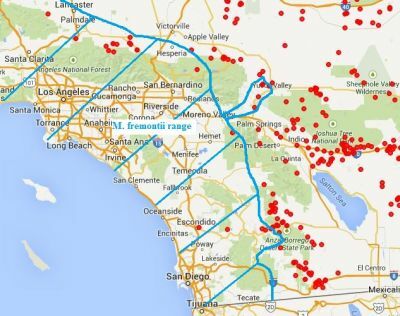 Click on the maps to get larger versions. I thank Jim Andre, Michael Charters, Keir Morse, Aaron Schusteff and Wendy Walker for permission to use their photographs here.